I’ve been out smelling my katsura quite a bit recently. When autumn sets in, the leaves of this east Asian tree (Cercidiphyllum japonicum) give off the faintest whiff of burnt sugar. It is a fleeting and hard-to-find fragrance: there’s no point in crumpling the leaves in your hands and sniffing; instead, you must walk by the tree and hope that little wafts of candy floss (or cotton candy, if you’re American) will stray into your nostrils. The sugary scent is just one of the katsura’s end-of-year tricks: its heart-shaped leaves, which have been a cool blue-green all summer, turn a festive apricot tone, veined and flushed with crimson. A strange fact about autumn colour is that the yellow and orange pigments (xanthophyll and carotene) are actually in the leaf all along — hidden away like a set of expensive underclothes. They become visible only when the green chlorophyll breaks down at the end of the season — when photosynthesis is finished for the year. The reds, crimsons and purples (anthocyanins) are another matter: these are produced from the glucose that in some species is trapped in the leaves when food manufacturing operations cease. A crisp, clear autumn (sunny days and cool nights) following a dry summer is what nature needs to make lots of anthocyanins — and a more brilliant palette of autumn colour. The display on this side of the Atlantic is never as sensational as that on the far side, where the forests of New England are noisily ablaze with red, orange and yellow. This All-American foliar brass band is composed of many different tree species, but the ones I remember from a spell in Massachusetts when I was a child are the maples: red maple, sugar maple and silver maple (Acer rubrum, A. saccharum and A. saccharinum). These trees are too large for most gardens here (and they won’t necessarily produce the same fireworks). If you want to try a mini maple explosion, though, do try the Japanese kinds (A. palmatum and A. japonicum). There are hundreds of varieties in cultivation, ranging from delicate-looking things a metre tall, to small trees (up to 10 metres), and all have exquisite showy-off foliage in autumn. The best for fire-engine-red leaves is supposed to be ‘Osakazuki’, which has an eventual height (very eventual — as it grows at a snail’s pace) of 6 metres. 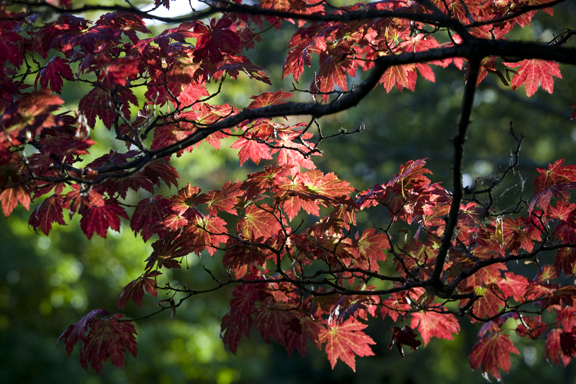 All Japanese maples like a fertile, moisture-retaining soil, and a sheltered spot away from drying and damaging winds. There are plenty of other woody things that go all technicolor at this time of the year. I’ve gathered some of my favourites below. Snowy mespilus (Amelanchier lamarckii): large shrub or small tree; yellow, orange and red in autumn. Barberry (Berberis): small and medium grow-anywhere shrubs; B. thunbergii and ‘Superba’ have good red autumn colour. Birch (Betula): most have buttery yellow autumn leaves. Dogwood (Cornus): many, including C. kousa and cultivars of C. florida and C. alba, have good autumn colour, from yellow to dark orange to plum. Smoke bush (Cotinus coggygria): large shrub with smooth, rounded leaves, of either blue-green or purple, depending on variety; autumn colour from orange to red to pink. 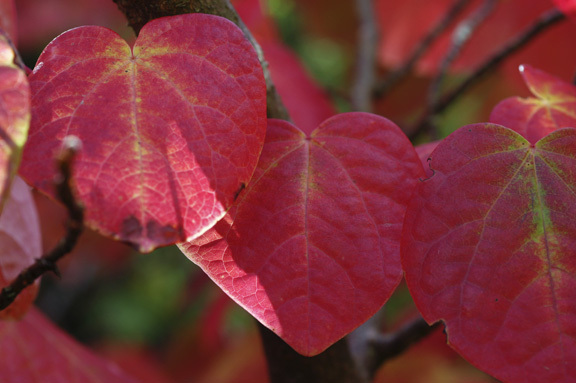 Disanthus cercidifolius, medium shrub with heart-shaped leaves turning wine and crimson; prefers lime-free soil. Spindle tree (Euonymus): the native E. europaeus has brilliant red autumn colour (and berries for the birds); the Asian E. alatus and E. planipes are also cherry-coloured performers. Larch (Larix): deciduous conifers that turn warm yellow and gold before dropping their needles. Liquidambar styricaflua: tall, upright tree; the maple-shaped autumn leaves are wine, red and yellow, and are long-lasting. Tulip tree (Liriodendron tulipifera): very large tree with curious, abruptly abbreviated leaves; yellow in autumn. Tupelo (Nyssa sylvatica): slow-growing, upright, medium-sized tree with ovate leaves turing yellow, orange and scarlet; needs lime-free soil. Persian ironwood (Parrotia persica): slow-growing, spreading tree; wine, red and orange in autumn. Cherry (Prunus): P. avium, our native wild cherry, and P. sargentii both turn orange and scarlet. Stag’s horn sumach (Rhus typhina): small tree, which can spread by suckers; the drooping pinnate leaves turn orange and crimson. Mountain ash/rowan (Sorbus aucuparia): yellow to orange autumn colour; other fiery members of the genus are S. commixta, S. serotina and ‘Joseph Rock’. Viburnum: several of the deciduous viburnums have orange to wine autumn leaves, including our native guelder rose (V. opulus) and V. plicatum from China and Japan. 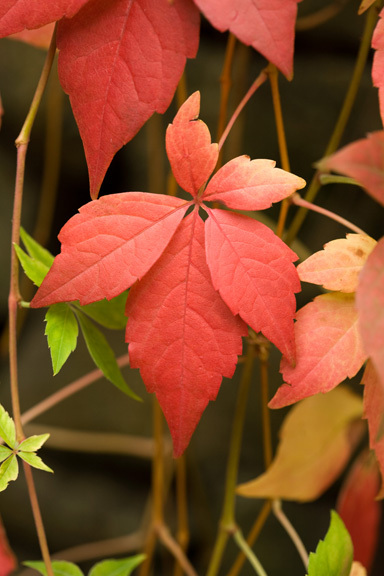 Parthenocissus: all members of this genus have startling red autumn colour, including Virginia creeper (P. quinquefolia) and Boston ivy (P. tricuspidata). Vitis (vine): the purple-leaved ornamental grape (V. vinifera ‘Purpurea’) turns dark purple in autumn, but the best of the vines is V. coignetiae whose huge, hairy leaves gradually turn bright red. I insist that I can get a smell similar to that of Cercidiphyllum japonicum from Parthenociss henryana but my wife has failed to sniff it despite several attempts. 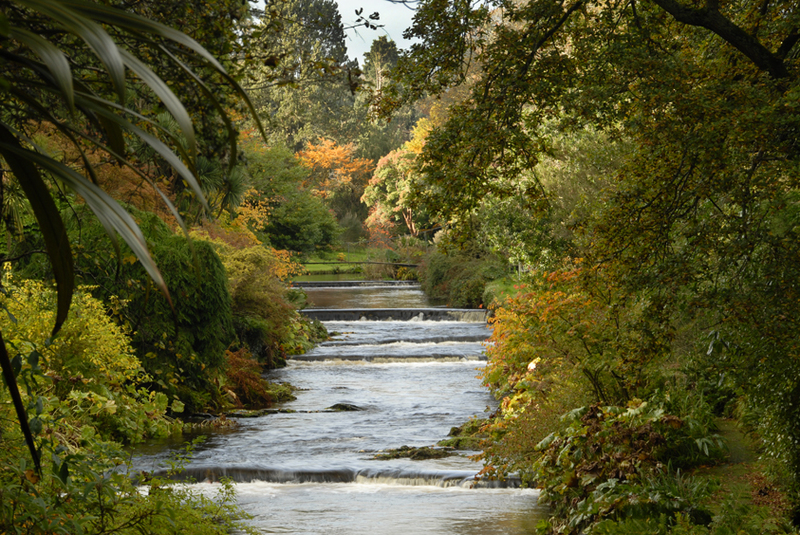 Mount Usher must be looking marvellous at the moment. Love the simile, ‘a set of expensive underclothes’. I’ll forever be revved up by fall! Got the scent of Katsura for the first time last year after growing it for about 10. Disanthus is now top of my plant shopping list after seeing that ravishing photo. Mmm lovely. 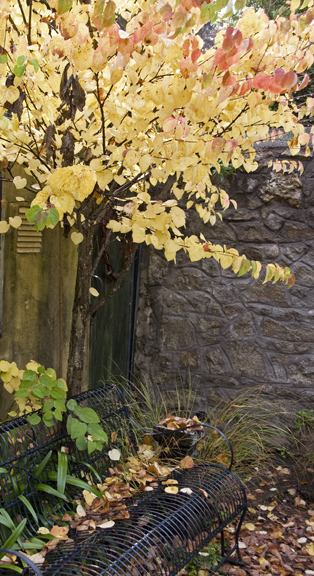 Have been thinking of trying to fit in a Cercidiphyllum japonicum for a while. (Remember learning the difference between this and the Cercis siliquastrum, by linking the ‘o’ in japonicum with the fact (I hope!) of it having o-pposite leaves. Is the Acer ‘Osakazuki’ the one also known as coral-bark maple, with that gorgeous winter skeleton?? You are currently reading That smells like autumn colour at One Bean Row.